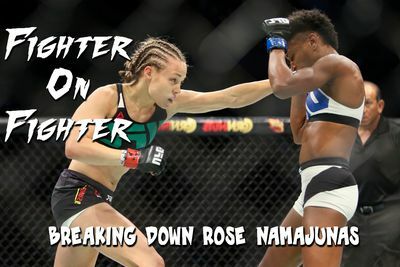 MMAmania.com resident fighter analyst — and aspiring professional fighter — Andrew Richardson breaks down the mixed martial arts (MMA) game of UFC Fight Night 80 headliner Rose Namajunas, who looks to get back into the title mix this Thursday (Dec. 10, 2015) inside “The Cosmopolitan” in Las Vegas, Nevada. Former Ultimate Fighting Championship (UFC) Strawweight title challenger, Rose Namajunas, is set to battle with rising star, Paige VanZant, this Thursday (Dec. 10, 2015) at UFC Fight Night 80 inside “The Cosmopolitan” in Las Vegas, Nevada. Namajunas’ initial claim to fame — besides obvious talent — came in her second professional fight. Wasting little time, Namajunas leaped at her opponent’s arm, securing a flying armbar submission in just 12 seconds. Next, Namajunas continued to find success on The Ultimate Fighter (TUF) 20, running through three more opponents via submission. Those victories earned her a shot at the belt, but Namajunas came up short in her initial title bid thanks to the relentless attack of Carla Esparza in Dec. 2014. Since then, she’s returned to the win column and is now looking to build a new win streak.